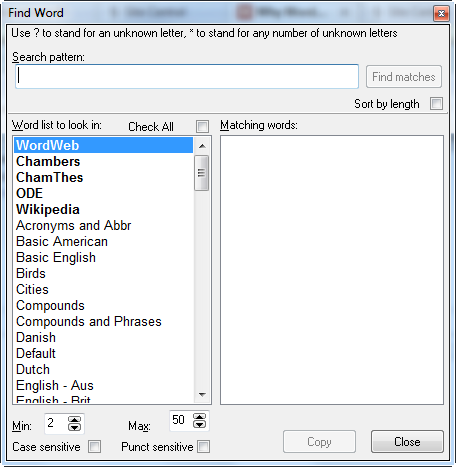 WordWeb Pro is a kind of 'umbrella word finder' containing dictionaries, word lists, thesauruses, and word search tools, all nicely bundled up into a single application. In fact its name, which was lost on me at first, is very apt, because when you're using it regularly it does start to feel like a sort of mini-Web devoted to words! What we have in WordWeb Pro is a way of bundling up all these tasks into one really easy-to-use integrated environment containing virtually all the resources you'll need. 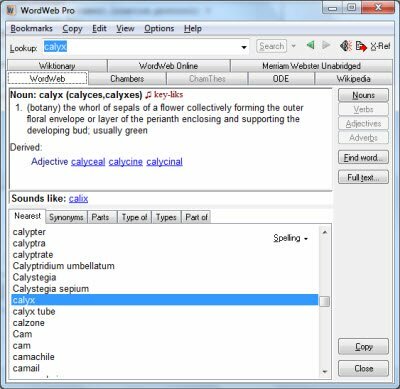 WordWeb Pro ships with a huge internal database of words and lists, but you're not lumbered with one person's opinion about the best dictionary or the best word finder. Instead, you get to add to the existing library your own favorite dictionaries, lists, and even websites, so that you hardly ever have to skip from one application or website to another. As you can see, I bought the Chambers English Dictionary and the Oxford Dictionary of English add-ons, as well as a bunch of other very handy and interesting word lists. I just wanted to be sure I had everything I was likely to need, whether I'm playing Scrabble, solving a crossword puzzle, working on my spelling, or (heaven forbid) reading a book! And by the way, when I say that all the functionality is 'bundled up', I don't just mean 'cobbled together', I mean seamlessly integrated. Suppose you're typing away in a Word document, reading a web page, or editing a clue in Crossword Compiler, for example. You just select the word (or phrase) you want to know more about and click a short-cut key to open up WordWeb Pro. Your word's definition, synonyms, and so on, are all automatically displayed on the screen. Although I've got tonnes of handy wordsmith gadgets on my laptop at home, I don't have many configured to start up when my computer starts. That would mean waiting half an hour each time I turn my computer on each day! But WordWeb Pro has made it on to that privileged shortlist.